At Saturday’s session the kids continued to work on their ongoing projects. We have some amazing creations in the works, including an isometric game in Alice. The mentors have said that it’s been so great to see the kids experiment with their creations and see it all come to life! Our wonderful mentor Anna did an excellent demonstration of Vega Conflict, including blowing various things up on the screen – which the kids loved. This is a game that Anna had a big role in developing. After the demonstration, the kids showed great interest in the aspects of the game development process. Anna was able to give an extremely informative talk to the kids, where they were able to understand the aspect of team cooperation within a company between game designers, graphics artists and programmers and how they all come together to create a final game. The kids were also able to get an appreciation of the technical aspects, such as servers that host the games and how gamers connect to play. A huge thank you to all our mentors at Chermside Library who are doing a terrific job in demonstrating new and exciting programs to the kids. One of our mentors Justin will be showing the kids what they can create by experimenting and exploring more aspects of Scratch. He has created an amazing Space Invaders game using Scratch which incorporates full background music, sound, multiple levels, backgrounds and spawning enemies. Stay tuned next week to check out the Space Invaders Scratch game. The mentors are planning to do a Ruby session using an easy integrated development environment. If you are registered at the Chermside session, please download Ruby before you come. Ruby demonstration at Chermside Library. Click image to download. For the more advanced kids that are interested in making mods, Anna can point you in the direction to a tutorial series she wrote that has tool-sets and a moding community. We hope you can make this Saturday’s session! We had another great session on Saturday where the kids were able to continue experimenting with Scratch and Alice. Our wonderful mentors did a fantastic job giving each participant one-on-one help in achieving what they wanted to create. All our mentors on Saturday did such a fantastic job! Our youngest mentor Jayden – who was a participant at Sunnybank Hills Library last year – did a wonderful job being the lead mentor for the session. He did three impressive Alice demonstrations, using the microphone and did a great job guiding the kids in a step by step tutorial, as well as making sure the kids were all at the same point. We had some very impressive demonstrations from the kids, including two penguin worlds and several rockets. This Saturday we have an exciting session planned. One of our wonderful mentor’s Morry has kindly offered to bring in some ROBOTICS! This will allow the kids to see how programming through a computer works by making a robot do exactly what they want it to do. We also have a HTML tutorial using Dash Assembly. Dash Assembly will allow the kids to create a webpage using HTML, CSS and Java right in their browser, with an easy to follow tutorial. Parents please note that if your child is doing the HTML demonstration they will need to sign up to Dash Assembly using an email address. Dash Assembly demonstration this Saturday at Sunnybank Hills Library. Click image to download. We had another great session at Carindale Library where our participants did something a little bit different. The kids started using code.org and light-bot.com which they all loved. They all seemed to like the challenge of LightBot and enjoyed the code.org exercise of tweaking Flappy Bird into a Scratch-style game. We had a few kids creating websites using HTML as well as some other kids using Scratch to create a cricket game, introducing variables and some other advanced techniques. A huge thank you to all our mentors at Carindale Library who are doing a wonderful job in helping the kids learn new programs and expand their programming skills. We’re very much looking forward to this Saturday’s session! This Saturday we will have a short demo on Python which is a widely used general-purpose, high-level programming language. 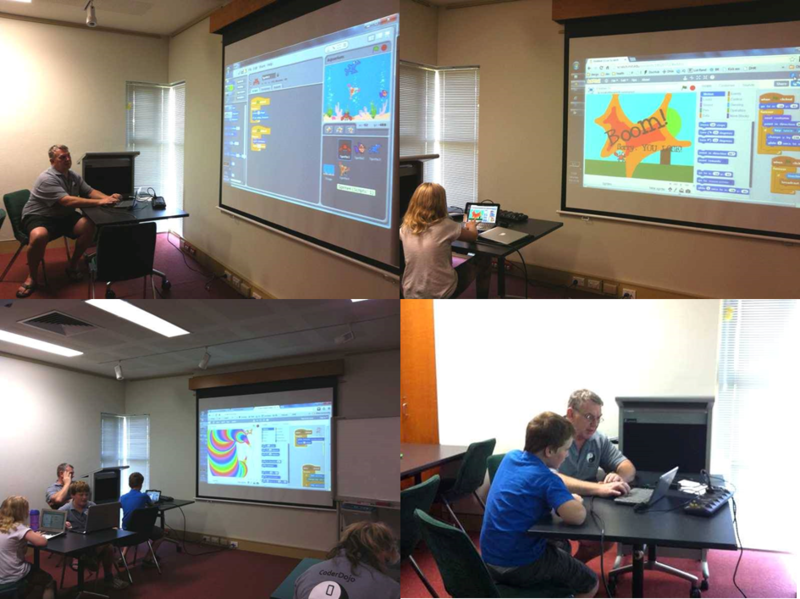 We also have a few other options for this Saturday’s session at Carindale Library such as; working on more advanced Scratch games in order to show the kids the amazing things that Scratch can produce. The kids can also continue doing some HTML, this time using Dash Assembly continue working on code.org activities as well as our playing with favourite little robot – Light Bot! Top Left: Our wonderful mentor Danny showing the kids what he created using Scratch. Top Right & Left: Clever participants sharing their projects. Bottom Right: Mentor Danny helping one of the participants. Photos provided by our mentor Helen. Our mentors are doing such a fantastic job at Mt Ommaney Library and we’re looking forward to what’s to come. This Saturday our wonderful mentors have a HTML demonstration planned using Weebly. Weebly is a powerful website creator and has everything you need to create a high-quality website. ‹ What’s been happening at CoderDojo Brisbane?